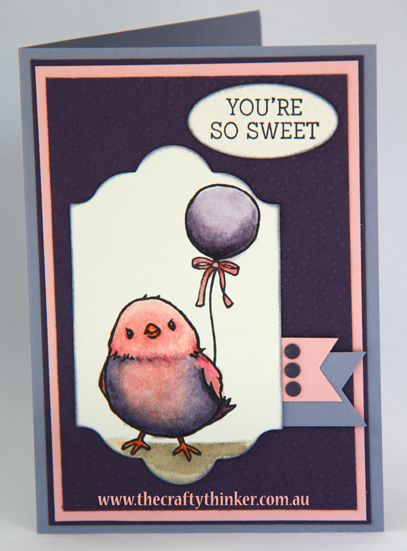 I have entered this card into this week's Crazy Crafters Team Project Highlight. To vote for it or any of the other beautiful projects, click on the heading above. I love this cheeky little fellow! He's so much fun to colour. With the colours I've chosen, though, perhaps it should be a female bird! She's only available in Sale-A-Bration (until 31st March) free with a purchase of $90. I stamped the bird with Archival Basic Black ink onto Shimmery White cardstock. I masked her and stamped the balloon so that she's holding the balloon string under her wing. My next step was to cut out the image using one of the Lots of Labels framelits, then I set about watercolouring her. I gave her an all over pale coating of Blushing Bride then I used Elegant Eggplant on her body, working from the edges towards the centre, keeping the brush moving to prevent hard lines. Then I added some more Blushing Bride to the chest and around the eyes and beak. I added just a hint of Rose Red to the wings, tail and to define where the head feathers meet the chest. Her beak and feet are Pumpkin Pie with a touch of Cajun Craze for shadows. I then turned my attention to the balloon, for which I used Elegant Eggplant ink. I gave it an all over light coat and then built up the depth of colour at the bottom and sides to add dimension. For the ribbon I used Blushing Bride and just a hint of Rose Red. At this point the bird was floating in mid-air (seemingly without the use of its wings! ), so I added some ground for it with Sahara Sand ink. 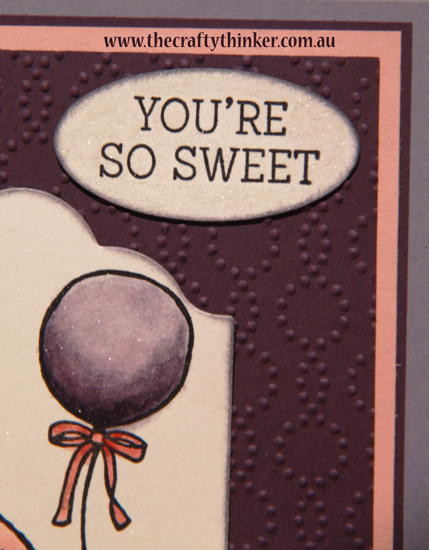 I stamped the greeting on a little piece of Shimmery White card and punched it out with the Large Oval punch. Then I edged both pieces with Wisteria Wonder ink. I gave the balloon and the greeting a coating of Wink of Stella for some extra shimmer. Wink of Stella is so pretty and so hard to photograph! I ended up putting it under a light! I embossed a piece of Elegant Eggplant cardstock with the Elegant Dots embossing folder and layered in onto Blushing Bride then another layer of Elegant Eggplant before adhering it all to the Wisteria Wonder card. I used the Triple Banner Punch on some little pieces of Wisteria Wonder and Blushing Bride cardstock and slipped them behind the main image, finishing off with some Elegant Eggplant Candy Dots. Best Thoughts - yes.... another Monochrome!